An unexpected move can turn your life upside down, but for rapper Parrish Tha Great, it was life-changing in the best possible way. A native of the Midwest, his job transferred him to Dallas, Texas, where he found that “the love was overwhelming so I just stayed.” He’s been rapping since he was a kid, and feels that music is the path that chose him. From the music he makes to the logos he uses and merchandise printed, everything Parrish Tha Great creates is a part of him. 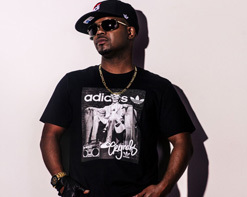 It comes as no surprise, then, that along with the “Get Rich” music video, he’s designed four t-shirts with the slogan “I Am Rich”, which are seen in the video. The shirts take influence from Versace, Gucci, Run DMC, and MasterCard graphics, and with all designs available on both black and white shirts, there’s something for everyone. We’re delighted to be partnering with Parrish Tha Great on this exciting campaign! Please let us know what we can do to get the “Get Rich” video into your beloved programming and if you’d like to get your hands on some of the aforementioned t-shirts to set up contests and on-air giveaways, we say “Bring It On!”! You can contact Andy Gesner and the HIP Video Promo crew at (732)-613-1779 or email us at info@HIPVideoPromo.com or visit www.ParrishThaGreat.com for more info on Parrish Tha Great.